Watch Dogs 2 launched with most of its multiplayer features disabled, but a week later and they're finally starting to come online. Ubisoft sent out a statement that confirmed a handful of online features are now enabled for PS4 players: finding targets for bounty hunts, triggering a bounty hunt on yourself, hacking into another player's world, inviting friends to co-op, and searching for other co-op players. Xbox One players should see the same features come online by tomorrow morning. 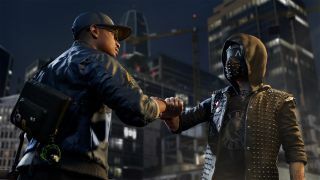 If the systems remain stable with these elements enabled (the multiplayer features caused lag and even crashes in pre-release testing and were switched off) then Ubisoft will roll out the rest of Watch Dogs 2's drop-in multiplayer: bounty targets, hacking rivals, and allied Dedsec hackers that appear seamlessly in your world. Like Dark Souls but with drones and emoji. We quite enjoyed the single-player campaign of Watch Dogs 2 in our review, saying it built on the strengths of the first game "whilst polishing up aspects that lacked depth to deliver a coherent, comprehensive experience". But we've held off on giving it a final score until we can try out the multiplayer, so hopefully it's a hacky good time.